That was just one of the many, many headlines that FLATSIXES.com contributor Andrew Granieri fired back at us when we sent him a picture of what we thought to be a suede wrapped Porsche Panamera we saw on Twitter last week. You see, Jamie Lester, a London based estate agent (realtor) who starred on the BBC's version of The Apprentice, snapped a picture of the Panamera below when he found it parked near his London based office and posted it on twitter with the hashtag #blacksuedeporsche. From there, the picture went viral. Well, maybe viral is too strong a word, but it did get re-tweeted 48 times and then the story was picked up by some UK media outlets. Of course, we saw it too and decided to do some digging. Here's what we found out. 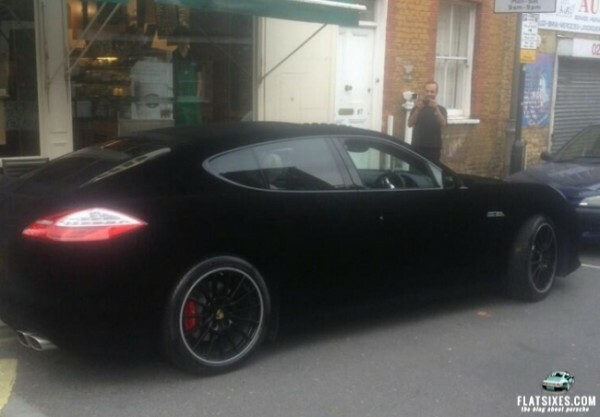 The Panamera is NOT finished in Suede as originally thought, it's actually wrapped in velvet. Yes, that's right, velvet. A company by the name of Raccoon Vehicle Wrapping prepared this one off Panamera for a customer just two weeks ago using a new material from the appropriately named organization Velvet-Cars.com. According to the manufacturer the "Velvet Elite Wrap 9100 is a flexible 720 microns film engineered to be applied to the inside or outside of vehicles. It is coated with special adhesives and durable textile fibers to withstand severe weather conditions." But What Happens When a Pigeon Shits on It? Besides wanting to know the owner of the car, is it another footballer with no taste, some other celebrity, or maybe a big Seinfeld fan, the most asked question on Twitter was "what happens when a pigeon shits on it?". According to Raccoon, caring for the wrap is no different to a conventional vinyl film, it's incredibly easy to wash, they just wouldn't recommend bringing it through an automatic car wash.
"Tequipment debuts the world's first "dry clean only" Porsche." "Nothing shrinks suede like a London rain; this Porsche owner is taking an unconventional approach to making his Panamera look smaller." "PETA claims too many cows are being slaughtered to decorate cars. One London man responds: "there's room for more!" "Miscommunication at UK Porsche Dealership: customer asks for new sway bars; receives new suede car." "Sheiks show off diamond-studded Ferraris and chromed Aston Martins. The working man's Porsche needs only stylish, sensible suede to turn heads." "Speaking of turning...We know Porsche is experimenting with hybrid power sources: what we didn't realize is this suede saloon was connected to a flywheel in Ferry's grave, which is reportedly spinning at 300,000 rpm, providing enough electricity to power the Stuttgart factory through the next century." What would you have used for a headline? Tweed Covered Porsche. No, It's Not a Wrap!